Owners, Kevin and Anne Plaut took over West Hartford’s infamous Harry’s Bishops Corner in 2007, formerly owned by Harry Rufleth. Kevin and Anne had been long time employees of Harry’s, originally meeting and working at Harry’s Pizza on Farmington Avenue. They moved to Massachusetts in 1997 for three years and returned to Connecticut in 2000 to get married and start a family. Upon their return to Connecticut, they reconnected with Harry at Harry’s Big Tomato restaurant located at Riverdale Farms in Avon CT. In 2002, Harry’s Big Tomato left Riverdale Farms to become Harry’s Bishops Corner in West Hartford. 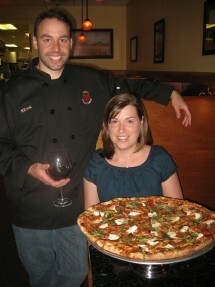 It is there that Harry was able to reconnect with the West Hartford community and reemerge as West Hartford’s premiere pizza restaurant. In 2007, Harry decided to retire from a long, successful career in the pizza business. But he didn’t want to sell the business to just anybody, so he asked Kevin and Anne if they were interested. Kevin and Anne are now the proud owners of Harry’s Bishop’s Corner and take great care of the name and reputation that has been built over the years. Kevin and Anne are so grateful to their customers for their support and encouragement. Kevin began working in the restaurant business when he was 15 years old. He worked in several restaurants, most notably Figs Restaurant in Wellsley, MA for world renowned chef, Todd English. His most enjoyable restaurant experiences were at Harry’s Pizza in West Hartford, and in a small Italian café in Hopkinton MA, called Café Italiano. While he received his best culinary training at Café Italiano, he learned the importance of simplicity and how to make the best pizza at Harry’s . At Café Italiano, the owner/chef worked side by side with Kevin to teach him about classical Italian food, wine and culture. It was those experiences that helped Kevin shape his philosophy on the importance of simplicity and its role in food, wine, and life. Today, at Harry’s Bishops Corner, Kevin’s culinary background and philosophy can be seen in the restaurant through the classic Italian ingredients used on a pizza and the warm welcoming service offered. He especially enjoys the Seasonal Pizza Menu as his opportunity to showcase traditional and also nontraditional pizza ingredients, sometimes bringing a pizza to a whole new level. Kevin also believes in using local ingredients whenever possible and featuring local agriculture and products. Anne is a West Hartford native and Hall High School graduate. She went on to attend and graduate from Regis College in Weston, MA . She began working at Harry’s Pizza in 1991 decorating pizza and eventually moved through several positions and roles in the restaurant. After three years in Massachusetts working for the Greater Waltham ARC, Anne returned to Connecticut with Kevin to get married and start a family. At this time she became an insurance producer and began working for her family’s insurance brokerage, The Thompson Agency, Inc. Today, Anne assists with running the restaurant, but most of all she is enjoying the role of full time Mom to her and Kevin’s three beautiful children.